Home › Buyer agent › Going postal parody or good governance? Dual Agency is a joke! BRAVO!!! When money can buy political influence and the Colbert Report commands more respect than Congress, how refreshing to read that one government agency is chastising another for patronizing business practices based on a conflict of interest. And no, it’s not a parody headline from The Onion; it’s the way our government was designed. 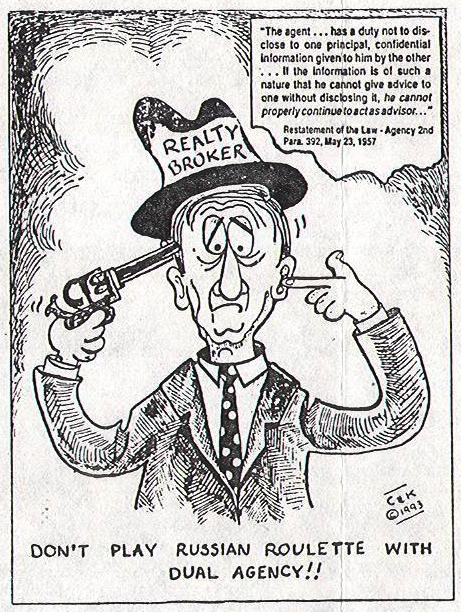 Agents from the same brokerage firm cannot negotiate on behalf of buyers and sellers in the same transaction. Despite heavily lobbied for laws that have “legalized” this impossible relationship, designated agency is a legal fiction that harms consumers. Just because it is legal, does not mean that it is good or appropriate for consumers. Designated agency serves only the interests of the real estate brokerage firm that desires to collect a double commission at the expense of appropriate client representation. If you agree to designated agency, you will be giving up the right to honest representation and you will be putting the brokerage firm in a position to manipulate your transaction in order to collect a double fee. After bailing out the last real estate boom / bust cycle, tax payers now guarantee nine out of ten residential mortgages, up from three in ten in 2006. Shouldn’t we insist on arms’s length transactions, too? Want to ask Senator Elizabeth Warren what she thinks?